This year we have a great range of items at 24studio for Winnie The Pooh fans of all ages, from toys and games to bedding, towels and rugs. So if you're looking for the perfect gift for a Winnie The Pooh fan, look no further. Look at this fantastic Winnie The Pooh Musical Railway toy - sure to delight, complete with all your favourite Winnie characters, and suitable for children aged 12 months and over. Press the chimney to hear different musical instruments. Now reduced to just £19.99 (was £29.99). 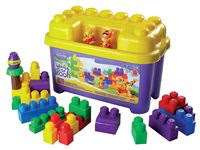 Winnie The Pooh Tub & Blocks - great fun for children 12 months and older, this Winnie The Pooh Mega Bloks set features all your favourite Winnie characters. Now HALF PRICE at just £9.99, this is a great Christmas gift. Buy the Winnie The Pooh Mega Bloks set now! 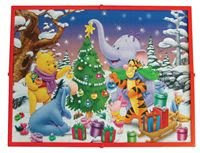 Look at this gorgeous Winnie The Pooh 352-piece jigsaw puzzle that includes 25 mini lights with 7 different light effects. When the puzzle is complete it can be fixed into it's unique frame (supplied) to hang on a wall. Suitable for children aged 7 years or older, it measures 68 x 49cm when completed and requires 2xAA batteries for the lights (not supplied). Only £17.99. Order your Winnie The Pooh Light Puzzle online today. 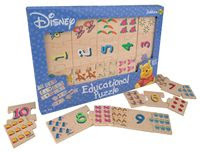 For younger children, how about this Winnie The Pooh Educational Puzzle, suitable for children aged 3 and over. Order your Winnie The Pooh Educational Puzzle today. This adorable 38cm soft bodied doll with vinyl arms and legs is a firm favourite - dressed in a Winnie The Pooh outfit, the doll comes complete with it's own Winnie soft toy. Suitable for children aged 10 months and over. Now just £17.99 (was £19.99). Disney Baby Winnie The Pooh - order online. 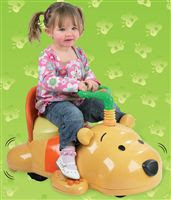 This Winnie The Pooh Ride-On is lots of fun for children aged 2 years and over. Complete with 6v battery, charger and automatic security brake. Winnie The Pooh Plush Toys - Available in 4 character options - Winnie, Piglet, Tigger and EEyore. Winnie Talking Toy - Winnie Stories and songs - Winnie narrates 8 exciting adventures with his friends in 100 Acre Wood. Personalised Winnie the Pooh Bubbles Towel - free personalisation! Personalised Winnie The Pooh nightie - free personalisation! 1000-Piece Disney Winnie The Pooh Jigsaw - "Around The Fire"
Winnie The Pooh character wall canvas, fleece blanket & rug - "Super Sleuths"
Winnie The Pooh character duvet set and curtains - "Super Sleuths"